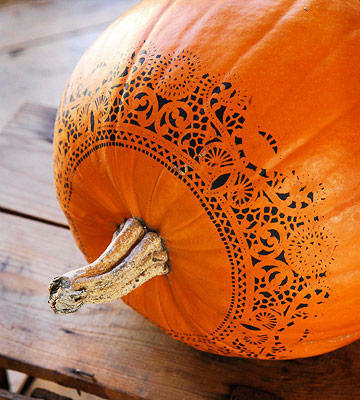 *Make the most of extra doilies you have tucked away in a cabinet by using them as a template for spray-painting. All you need is a little tape to keep the doily steady and some spray paint-perfect for those of us who aren’t especially gifted in the freehand design and drawing department. Use a deep silver or gold spray paint for a more dramatic look, or stick with black or white for a more traditional pumpkin. *We love this mod black and white design: the contrasting colors really make the lines and shapes pop. You can get creative and use diamonds, stars, triangles, lightening bolts, whatever strikes your fancy. This chic dichromatic design would look awesome on a tablescape surrounded by delicious Halloween treats. Save yourself the effort and elbow grease of cutting out a face or challenging shape and scooping out the seeds by just scraping the top layer of the pumpkin (with a lemon zester or clay loop) to make a dramatic design. 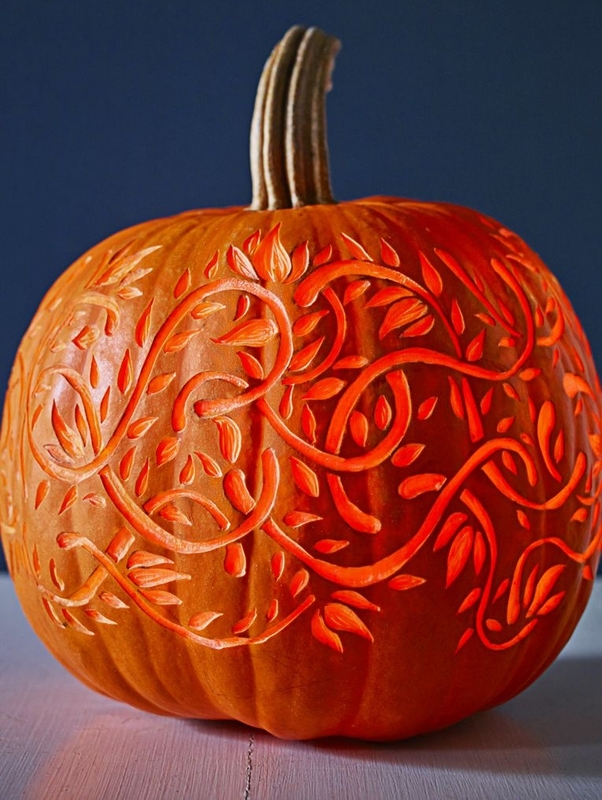 This type of pumpkin will likely keep slightly longer since only the pumpkin skin is scraped. Whether you tackle a twisty tangle of leafy vines or try scraping out a festive phrase (like “Got Candy?” or “Take a piece of candy…if you dare”), this technique invites endless creativity. Although little ones often favor a toothy grin and simple triangle eyes, pumpkins can give off a surprisingly classy vibe when used as a canvas for painting floral designs. The pink petals stand out against the deep blue background and the bright leaves. We think one of these would also make an amazing hostess gift for any of the spooky and sweet gatherings you’ll be attending this season.